Ella Johnson, a 49-year-old school teacher, came to Johns Hopkins in 1994. Polycystic kidney disease had been diagnosed from an abdominal scan four years earlier, although it was not seen in an X ray of the kidneys at age 22. The X ray was performed because she had recurrent urinary tract infections ever since age 18 and had required urethral dilatations. High blood pressure had been present for nine years and had been treated with a variety of drugs, including an ACE inhibitor. 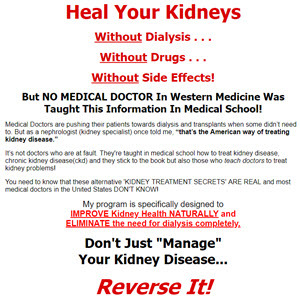 She had no symptoms of kidney failure. Her mother had had polycystic kidney disease too and had been a patient here. Ella had two healthy children. Physical exam was normal except that the left kidney could be felt easily and was therefore considerably enlarged. At her request, despite the absence of symptoms, she was placed on a very-low-protein diet supplemented by essential amino acids. She also started fish oil and gets regular exercise. She does not smoke. During nine years of follow-up, she has progressed very slowly (1.8 ml per minute per year). At this rate she will be well into her 70s before she needs dialysis or transplantation.